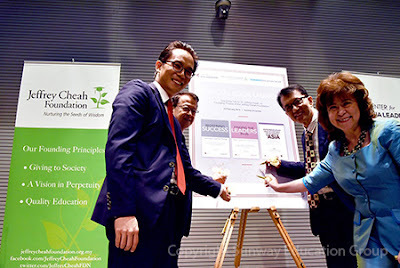 Established in Boston in 2013 by co-founders Samuel Kim and John Lim, CAL’s regional base was later set up in Kuala Lumpur in October 2015 in collaboration with the Jeffrey Cheah Foundation, one of Southeast Asia’s largest social enterprises and Malaysia’s largest education-focused social enterprises. The three books are published by CALI Press, the publication arm for CAL. CALI Press is a platform for Asia Leadership Trekkers, Asia Leadership Institute Fellows and alumni, as well as Harvard experts to share ground-breaking ideas, offer strong guiding expertise, and disseminate insightful analyses to a wide variety of individuals and organizations, in Asia. 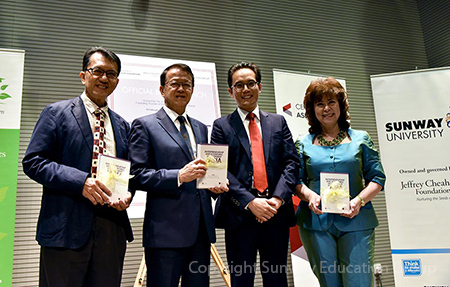 Tan Sri Dr Jeffrey Cheah, Founding Trustee of the Jeffrey Cheah Foundation, said that CAL will drive the purpose of the Foundation forward. “I am excited with the collaboration between the Center for Asia Leadership and the Jeffrey Cheah Foundation. Together, I know we will be able to provide many opportunities for the rising generation to develop purposeful leadership skills, which are much-needed to navigate the exciting challenges in growing Asia,” he said. “The publications provide youths with exceptionally insightful views into the minds of their peers whose experiences are invaluable to develop a future generation of leaders who are globally-minded and purpose-driven to create a sustainable future for all,” he added. Samuel Kim, President, CAL, said at the launch, that the Center’s location in Malaysia will provide a platform for students across the world to access Asia, and for Asian students access to cutting-edge Harvard leadership frameworks. The event included a sharing session by Hayley Lee, Sunway International School, one of the 13 contributors for “Finding the Leaders in Us: New Goals for Success”, and Josephine Lim, Ernst & Young, one of the 16 contributors to “Redefining Success: Learning to Lead for Change”. Both contributors read extracts from their chapters, chronicling their transformative journey as eager students hungry to develop the necessary skills to stay ahead in a technology-driven and conceptual age. “Entrepreneurship and Economic Development in Asia” comprise seven thoughtful essays written by graduate students from Harvard University, MIT Sloan School of Management and Stanford University who participated in two Asia Leadership Treks in 2015, an intensive, experiential learning and public service program which took them across Hong Kong, India, Indonesia, Japan, Korea, Malaysia, Mongolia, Nepal, the Philippines, and Thailand. The Trekkers’ essays offer a much-needed window into the complex story of contemporary Asia from their travels around the continents and meetings with both the current leaders and the next generation of leaders in business, government, and social enterprise. 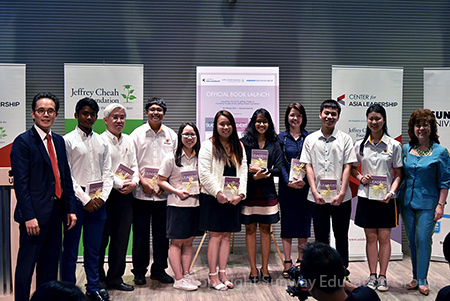 “Finding the Leaders in Us: New Goals for Success” is a compilation of 13 life lessons which are compelling and heart-warming, insightful and informative, penned by participants of the 2015 Trilateral Leadership Summit organized in Sendai, Japan, and delegates from the Asia Leadership Youth Camp held in Sunway International School in Kuala Lumpur, Malaysia. The stories are testament that there is always something youths can teach us on what it means to be the future leaders of Asia in the 21st century. “Redefining Success: Learning to Lead for Change” is a compilation of essays from 16 delegates of the 2015 Executive Leadership School featuring stories, reflections and lessons on personal leadership, communication and confidence building, which emphasises that exercising leadership is not about being the one in charge or on the top of the hierarchy; rather it is about taking up the challenge to pursue something greater and higher, in turning downsides into upsides, in contributing to make our world a better place.